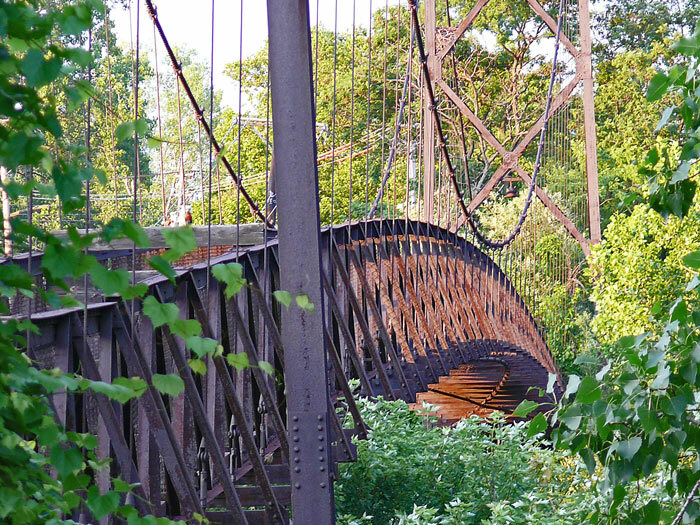 This could be my Bridge on the River Kwai - Neighborhood pedestrian bridge – Cleveland live-work history. Submitted by Jeff Buster on Fri, 07/03/2009 - 23:56. It took a few wrong turns, but we got here this afternoon. Cleveland's only suspension bridge. A pedestrian bridge. A very elegant statement of civility. Like the Coast Guard Station, left to wrack and ruin. My friend explained: neighborhoods used to walk to work. That's why the pedestrian suspension bridge was built. If I were at the $ helm, this bridge would be the recipient of "stimulus funds", and would be sandblasted, primed, painted (all non-union) and a new deck installed by Christmas. Submitted by Jeff Buster on Sat, 07/04/2009 - 12:10. The south end of the bridge can be accessed by car/foot/bike at East 67 and Sidaway. Bring a tall step ladder to get a view up over the undergrowth - I'm going back with a 10' ladder to get better photos. The area is strange, and has been since the Torso Murders - one found under the bridge. Submitted by greatboldworld on Fri, 03/25/2011 - 14:58. Is that the bridge that connects the neighborhood N. of Woodland to Francis Avenue just East of 55th? My Aunt used to live on Francis and it had an active parish once. Some good beer joints too. Plenty of trucking and steel related jobs. Family worked around there. It was pretty neat to me decades ago. I also recall the other bridge connectinging Madison to Lorain at 61st...and a small one over the tracks east of W.41th. Brookside Park had several stairs in and out. And, the old "Snake Road" walk. People lived in alleys with pedestrian alley cut-throughs in parts of the West Side, like here in some Jersey towns. Yep, people was lived safely in such high density neighborhoods, convenient to their work, schools, and loved ones. And, then, they couldn't abide the decline in schools and safety. It all comes down to quality of life. Nothing fancy. Submitted by greatboldworld on Fri, 03/25/2011 - 15:00. Does Anyone remember the serpentine bridge that connected the flats to the Detroit Superior Bridge heading east? WOW!! Submitted by lmcshane on Sun, 07/05/2009 - 08:33. We need more bridges Jeff--thanks for this beautiful image. Submitted by dweller1 on Sun, 07/05/2009 - 13:49. It was a working bridge until the 60s I think. The wooden planks were set on fire numerous times ultimately leading to its closing. Racial tensions at the time between a mostly white neighborhood on the sidaway side and the CMHA projects on the other. I cant get over how solid it still is. Submitted by Jeff Buster on Sun, 07/05/2009 - 21:48. The Cleveland Memory Project has a photo of the closed bridge in 76. In the snow. I didn't live here then, but I have a spinal feeling that the bridge was closed because of racial hatred between one end of the bridge and the other end of the bridge. Amazing that a bridge could do that. If you ride the Rapid out to Shaker Square, you can see the suspension bridge spanning the ravine on your RH side after you leave the E55 street station. Bridge Closed. Closed for 36 YEARS. Racial division. And 36 years later do you think we've gotten over it? I don't. But the steel cables don't care. They are still suspending. Amazing. Iron molecules in tension for 36 years. No maintenance. Haven't given up. No paint. Won't let go. Maybe racial hatred is like the iron molecules in the cables. You can pull on the molecules for years and they don't let go. Advantageous for the suspension cables - that they don't break...but a disaster for our community that our feelings can't let go. Submitted by None on Mon, 07/06/2009 - 01:27. Look at this map, the blue/green line travels under Woodhill Road. It has a bridge at Ambler, McCurdy, East 92, East 90th and then at Holton then it cross the Red line. At that location is a crossing of the red line. If I am on the blue/green traveling west, I can get off at 55th and then get back on the red line to go to the airport or to university circle. The 55th station is the only station beside the terminal that has access to all lines. If you are on Shaker and then cross Woodhill it becomes Buckeye. Between Woodhill and Woodland you will cross a bridge under that bridge is the Red line. It about getting from the east to university circle by train. It seem to me that the Red line and combined with a connector to the blue and green, could run center line on East 105 and then into the clinic and then loop back to cedar and then run center line on cedar to get back to Cedar station. That’s just a connector for the blue/green and loop of tracks. The entire section of the blue and green tracks between Holton and 68th are unnecessary, look close at it, if Shaker blvd went all the way to Woodland, with the tracks then it could be connected with the Red line. Then all the tracks from Woodhill to 68th would be unnecessary and that a could become a park and natural ravine. Look close at this that ravine the path that the blue/green runs on comes closer to that 1000 feet of Kingsbury still open on the Cuyahoga. Attempting to open some green spaces to the river, is it time for that, I would say. That’s about industrial clustering, inventorying industry and consolidation into clusters. Industry has very different needs then commercial and residential areas. The grids are different, the roads need to be heavier and the sewers separated to handle and monitor hazardous wastes. Ideally industry is or should be on the convergence of interstates and commercial as well as commuter rail. When the Euclid corridor was built they stopped and consider what is under it, in the opportunity corridor it is about that as well. The rail and the sewers are very prevalent in that area, they should be considered. Oengus - Planner on the money. Submitted by Jeff Buster on Mon, 07/06/2009 - 23:18. Why is it that Crazy Realneo can come up with drop dead common sense from such a conglomeration of out-there activists? While our paid for agents fumble along? But there are complications to every plan. Look at the Kingsbury Run Bridge. If that span were to be resuscitated, it would probably need new cables - pretty much new everything. And it would need to be totally enclosed so no child or adult could jump or fall out. The span is 85 feet above the ground in the middle, and has been the scene of a tragedy already. So maybe the racial division perception is history, while the mute bridge is unable to speak about the news. That’s why this could be anyone’s Bridge on the River Kwai. Whatever you think, whatever you do, will be wrong. But the challenge is very enticing. Submitted by lmcshane on Mon, 07/06/2009 - 02:26. Tore down the Clark Pershing bridge, too, Jeff---sadly, this town is not about bridge building and it's killing us, all the while making a few folks rich on the HUD monies involved. Submitted by None on Mon, 07/06/2009 - 14:22. Extending Shaker Blvd, to Woodland, extending the tracks with it. The intersection of those lines is seen by two bridges that form a 'V' shape, one is Woodland the other is Buckeye. At that location is a scrap yard, between the tracks and adjacent to St John Cemetery. That is a very good location for a combined station, at the bridges and using the scrap yard land. The path of the Blue/Green line could be a road it could connect to I490 and then follow the old path of the blue line. The two lines both the blue and red could share tracks converging at the proposed junction. They could run to the city or to university circle. Trains leaving shaker could be going either way; be bound for the city center or university circle. The path of the blue could be a road that connects to east 105th , following the track to just west of Woodhill then going north along commercial tracks to East 105th. Another catalyst would be to widen East 79th street and adding a tram center line, that tram could connect the proposed station. East 79th could be a development corridor for residential and commercial. The tram would feed the transit hub. The shaker extension would call for residential units on the street, then so would the Widen 79th street. Intersections and stations developed as hubs for both residential and commercial. It would allow those on the clinic campus to get to shaker square on short train ride. As well as little Italy, the Stations should all serve trains of both lines. That is what this is about. A person could live on shaker square and then take the train to the Clinic or Juvenile Justice center. They could take it to case, currently the train leaving shaker square do not connect to University Circle. Submitted by urbane gorilla on Tue, 10/27/2009 - 23:37. I think restoring the bridge is a non-starter; keeping it as a landmark - certainly worthwhile. by the way - gorgeous photo. Submitted by ward14resident on Wed, 10/28/2009 - 01:23. Nice photo of the bridge Jeff Buster. Thanks. Women Veterans Need Your Support! Report Prior to Medical Center Company hearing on Tuesday!